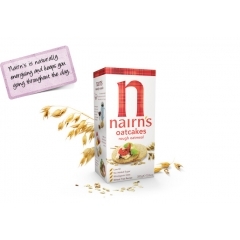 Home > Pasta/Rice/Grains > Nairn's Oatcakes. 300gm. 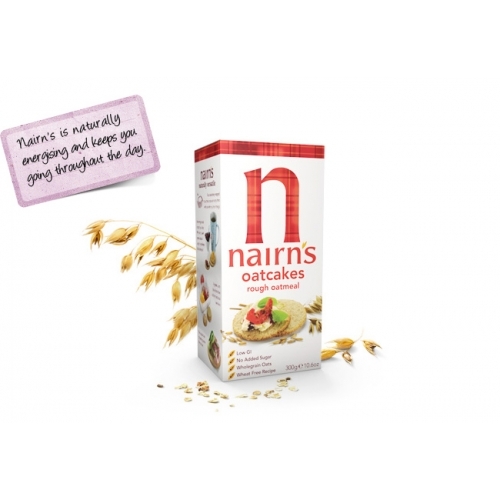 Nairn’s Rough oatcakes are seriously oaty, so it’s no surprise that they are our most popular oatcakes. Wholegrain oats release energy slowly so the high oat content in these oatcakes makes them a naturally energising snack to help keep you going throughout the whole day. The tempting toasted oat flavour of our Rough oatcakes is the perfect accompaniment to many sweet or savoury toppings. Why not try them with a cheese board instead of your usual crackers? Rough oatcakes are high in fibre and are made with wholegrain oats to a wheat free recipe. They contain no added sugar, GM ingredients, artificial colourings, flavourings or preservatives. Wholegrain oats (88%), sunflower oil, palm fruit oil, sea salt, raising agent (sodium bicarbonate),sustainable palm oil. Contains Gluten. Both our recipe and factory are nut free. We cannot guarantee that our ingredients are nut free. Manufactured on equipment that handles milk.